During the interview Jacobs explained that he came to the realization that it wasn’t possible for man to live by every rule without falling short of the ideal. He claims to have significantly cut down on gossip and lying, but could not completely wipe those vices out of his life. What I found particularly disappointing about his “study” though, was that Jacobs failed to see his need for someone or something to cleanse him of those shortcomings and make him right with God. 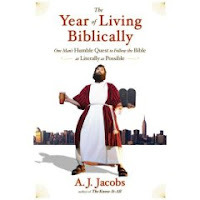 Unfortunately, Jacobs seems to see the Bible as simply a book of rules. As I personally seek to reach out to those in this world, I can’t help but wonder how many hold to Jacobs’ line of thinking. If we are faced with a world that believes the Bible is simply a book of rules how do we combat that? How do we teach the forgiveness, grace, and love?